Do Right, Fear Nothing. Sam Hopkins is a good kid who has fallen in with the wrong crowd. Hanging around with car thieves and thugs, Sam knows it’s only a matter of time before he makes one bad decision too many and gets into real trouble. But one day, Sam sees these thugs harassing an eccentric schoolmate named Jennifer. Finding the courage to face the bullies down, Sam loses a bad set of friends and acquires a very strange new one. Because Jennifer is not just eccentric. To Sam, she seems downright crazy. She has terrifying hallucinations involving demons, the devil, and death. And here’s the really crazy part: Sam is beginning to suspect that these visions may actually be prophecies—prophecies of something terrible that’s going to happen very soon. Unless he can stop it. With no one to believe him, with no one to help him, Sam is now all alone in a race against time. 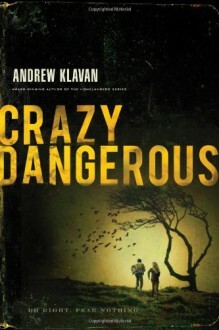 Finding the truth before disaster strikes is going to be both crazy and very, very dangerous.